I’m sure you’re skeptical. 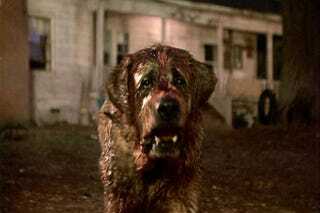 “What could possibly go wrong with a remake of Cujo? It’s about a movie about a giant rabid dog. It’s pretty hard to mess up!” Yesterday, I would have agreed with you. Today, I have four words for you: Canine Unit Joint Operations. Yes, somehow Cujo has gone from an insane dog menacing a woman and her child while they’re trapped in their car (based on the Stephen King novel) into C.U.J.O., presumably referring to some sort of elite canine soldiers who very possibly fight terrorists. I can only assume that the training to make them the most efficient killers somehow goes awry and one or more C.U.J.O. soldiers start attacking their own masters. I would also be willing to bet virtually any amount of money that the dogs have been genetically engineered in some way to become perfect killing machines and will be rendered in CG. Any takers? This idea is so dumb, but I have to confess it makes me far more interested in seeing the movie than I would have been if it was a straight-up remake. Although if we get The S.H.I.N.I.N.G. next there will be hell to pay.